Medal of Honor nominee Candelario Garcia was born in Corsicana, Texas, Feb. 26, 1944. He enlisted in the U.S. Army on May 28, 1963. Garcia distinguished himself on Dec. 8, 1968, as a team leader during a reconnaissance-in-force mission near Lai Khe, Vietnam. Garcia destroyed two enemy machine-gun positions in an attempt to aid casualties that were in the open and under fire. Garcia then rejoined his company in a successful assault on the remaining enemy positions. Garcia passed away on Jan. 10, 2013. In addition to the Medal of Honor, Garcia received the Distinguished Service Cross (this award will be upgraded to the Medal of Honor on Mar. 18), Silver Star, Bronze Star Medal , Purple Heart, Air Medal, Army Commendation Medal with “V” Device and one Bronze Oak Leaf Cluster, Army Good Conduct Medal, National Defense Service Medal, Vietnam Service Medal with two Silver Service Stars and one Bronze Service Star, Meritorious Unit Commendation, Combat Infantryman Badge, Expert Marksmanship Badge with Rifle, Republic of Vietnam Gallantry Cross with Silver Star, Republic of Vietnam Campaign Medal with “60” Device, Republic of Vietnam Gallantry Cross Unit Citations with Palm Device and Republic of Vietnam Civil Actions Honor Medal Unit Citation, First Class. The President of the United States of America, authorized by Act of Congress, July 9, 1918, (amended by act of July 25, 1963), takes pleasure in presenting the Distinguished Service Cross to Sgt. Candelario Garcia, United States Army, for extraordinary heroism in connection with military operations involving conflict with an armed hostile force in the Republic of Vietnam, while serving with Company B, 1st Battalion, 2nd Infantry, 1st Brigade, 1st Infantry Division. 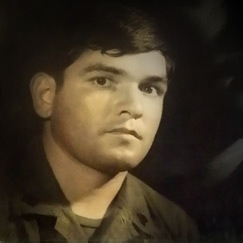 Garcia distinguished himself by exceptionally valorous actions, Dec. 8, 1968, as a team leader during a company-size reconnaissance-in-force mission west of Lai Khe. Garcia’s platoon discovered communication wire, and other signs of an enemy base camp, leading into a densely vegetated area. As they advanced they came under intense fire, causing several men to be wounded and trapped in the open. Ignoring a hail of hostile bullets, Garcia crawled to within ten meters of a machine-gun bunker, leaped to his feet and ran directly at the fortification, firing his rifle as he charged. He jammed two hand grenades into the gun port and then placed the muzzle of his weapons inside, killing all four occupants. Continuing to expose himself to intense enemy fire, Garcia raced fifteen meters to another bunker and killed its three defenders with hand grenades and rifle fire. After again braving the communists’ barrage to rescue two casualties, he joined his company in an assault, which overran the remaining enemy positions. Garcia’s extraordinary heroism and devotion to duty were in keeping with the highest traditions of the military service and reflect great credit upon himself, his unit, and the United States Army. Garcia is set to receive the Medal of Honor posthumously in a ceremony at the White House on March 18.